Our 6 independent surface mount lines are ideally suited to efficiently manufacture a wide range of assemblies within varying ranges of complexity. Since our equipment is configured for rapid change over and maximum flexibility, we can respond to customer pull in requests, move products easily between lines and accommodate both high volume and small runs. WORLD electronics, therefore, welcomes clients both large and small, and offer the same benefits to clients with a run of just a hundred to clients who need tens of thousands of products. WORLD’s product quality begins with our rigorous first article process. We designate one piece in each build and our highly skilled operators and engineering support team closely monitor it after each process to assure it meets or exceeds our stringent quality criteria and our customers expectations. WORLD offers both SMT and thru-hole technologies for mounting components to our PCBs, whichever our clients’ specifications require and can build to IPC 610-2 or -3. Thru hole or through-hole technology is the method by which components are mounted to a PCB using physical leads. These leads are hooked through holes drilled into the circuit board, hence the name. The leads are then soldered to the opposite side of the board to keep the component in place. 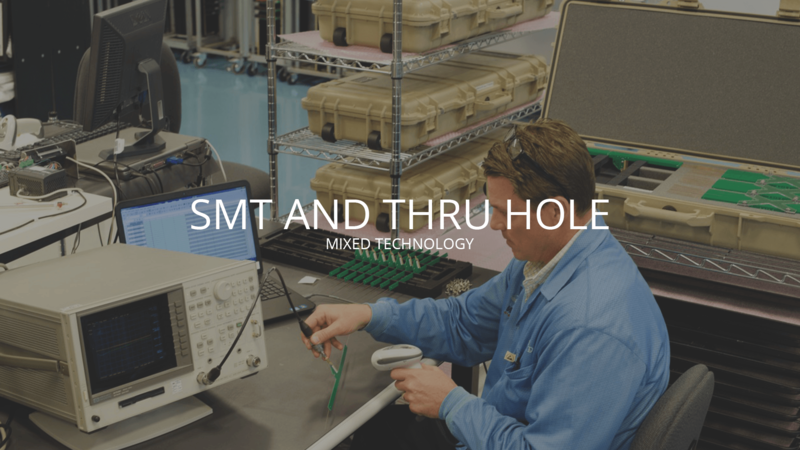 Thru hole technology is considered legacy by some manufacturers, but WORLD electronics recognizes that some clients prefer the simplicity and ease of rework that thru hole allows. Whereas the soldering of these leads was done by hand in the early days of electronics, WORLD electronics utilizes high-end technology that can solder thousands upon thousands of thru hole PCBs per hour. The bonds that thru hole technology builds between components and their PCBs are physically strong, making the product more durable and capable of withstanding heavy loads. Thru hole technology is also preferable during the prototyping stage, and products may be refined to make use of SMT later once proof of concept has been established. SMT, or surface-mount technology, is a method by which PCBs are manufactured through their components being mounted directly to them. This reduces the cost of PCBs, which no longer require drilling for the mounting of components. It also considerably reduces production time, allowing for more components to be mounted per hour. The nature of SMT means that SMDs (surface mounted devices) must be flat, to maintain a direct connection between PCB and component. While this can be difficult to achieve, WORLD electronics’ high value and high-efficiency pick and place machinery have a 99.9% accuracy rate, reducing waste to an absolute minimum. SMT involves first applying solder paste to the PCBs solder pads using a screen printing mechanism. The boards are then brought through our pick and place machines, which applies the components to the PCBs. The production run then moves through a reflow soldering oven, where the solder is solidified and the components are soldered into place. If the board required components on both sides, the board will then go through the process again. Following on from the board’s complete assembly, any excess flux can then be washed away using deionized water and detergent, in combination with a quick blast of air. This reduces the long term failure rate. Alternatively, some methods of manufacture allow for some solder to remain on the board by design, which reduces the cost of cleaning. SMT PCBs are typically smaller than thru hole, since the component is directly mounted to the PCB, and in certain circumstances does not need to be wire bonded. Because all that is required is a small amount of solder, SMT PCBs are easy to manufacture on an automated production line, which reduces overall cost in both labor and parts.